I will admit it. Part of me is still 13 years old. It probably always will be. So when a book’s opening chapter involves a complex plot to murder an alien trade negotiator using provocatively scented flatulence to send coded messages, messages understood by the negotiator as questioning his virility, I could not help but laugh. Loudly. As I said, part of me will always be 13. 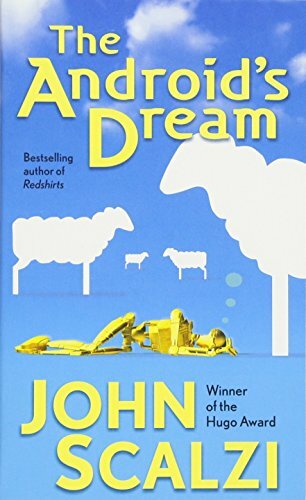 The Android’s Dream may be the funniest science fiction book I have read in a decade. Written in 2006, I am so sorry that I was not aware of it years ago. It has the trappings of serious sci-fi. An alien race, nominally aligned with the earth, is facing a succession crisis. Part of the succession plan for the ruling clan involves the sacrifice of a sheep, a sheep specially genetically designed for the ruling clan by biologists on earth (a result of a previous treaty between earth and this planet’s rulers). However, all of the sheep on the alien planet succumbed to an illness, so the original line is only available on earth. And someone is killing those sheep. Harry Creek is a low level state department employee, but he is much more than that. A computer prodigy, he won the Westinghouse Science Award as a teenager. A war hero, he single-handedly saved the few members of his battalion who were not wiped out in a pivotal battle. Back on earth, he just wants to live a quiet life. When he is asked to try to find the sheep for the government, he traces their DNA to a very unlikely source: Robin Baker, a young woman who owns a pet store near Washington, DC. What follows is a combination of humor and hijinks that send Harry and Robin from a shopping mall to an interstellar cruise ship to the halls of power on the planet Nidu. All of Harry’s formidable skills are needed to keep Robin and himself alive and one step ahead of their adversaries. Scalzi is hilarious. He introduces us to characters like Takk, an alien on a religious quest to experience sin, who occasionally eats people when his job requires it (were he not on a quest to experience sin, that sort of thing would be too sinful to contemplate). We meet Chet, whose job it is to monitor a play space in the mall (it uses an anti-grav generator that requires the use of special shoes) and who lives to regret giving those special shoes to Harry and Robin before they get into the play space. A computer possessed of a human consciousness (uploaded upon the person’s death) realizes just how horny she is. These are not the usual tropes in science fiction, and they make for some laugh out loud moments throughout the story. And, because it’s John Scalzi, we are asked to consider some deeper questions. What are the ethics involved in genetic manipulation? Is a computer with a human consciousness a sentient being? Do the rights of individuals trump the needs of a planet? With his usual deft touch, Scalzi presents the dilemmas without being heavy handed or dogmatic. His characters find their own answers, but seldom does he leave us thinking that their answers were the only possible right answers. Science fiction as a genre has long been marginalized, not considered worthy of serious consideration by literary critics. Frankly, this is ridiculous, and says more about the critics than it does the genre. Any who still hold this prejudice should be silenced by two words: Margaret Atwood. The Android’s Dream is not a literary classic, but it is a delightful work by an author who himself is creating great books that belie that stigma. Even in a book that is comedic and lighthearted, Scalzi tackles deep, current issues of identity and ethics. He might be playing in The Android’s Dream, but he is playing with grownup toys in the grownup’s playground. And he proves with each new chapter that he belongs. Also read Head On: A Novel of the Near Future (Lock in) — the next book in the series.